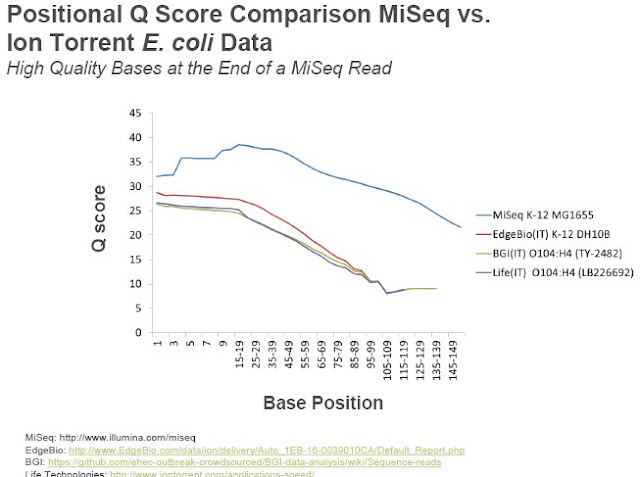 Illumina has released a MiSeq dataset for E.coli MG1655 on its website. Accompanying the FASTQ and BAM files is a presentation, the first half of which compares the performance to big brother HiSeq. The second half is an explicit comparison against the available Ion Torrent. 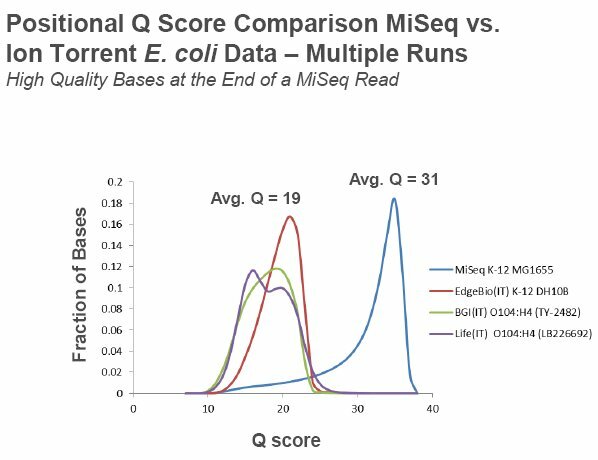 I won't spend much time on the HiSeq comparison, as it appears to be essentially the same as what appeared in the CSHL poster. I will remark that their comparison of quality does it right, plotting Phred scores. This is in contrast to the recent Ion Torrent 316 information, which presented error rates on a linear scale. This is either a sign of a lack of intelligence or an attempt to insult the community's intelligence; such plots hide any real changes in quality. However, the presentation mentions that read 2 in a paired end run has lower quality, but only read 1 is plotted; plotting both would have been more informative and honest. I haven't had time to do much of my own analysis, so what follows is all Illumina's plots. There aren't a lot of surprises in the data, but it does suggest how Illumina is going to initially market against Ion Torrent. Given the shots they take, I expect most of these messages will be changed due to either existing or expected changes in the Ion platform. 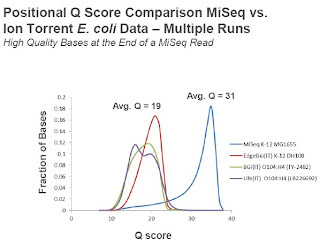 highlight the current run length advantage of MiSeq (150 vs. ~120 for Ion Torrent). A second plot hammers home the higher overall quality score distribution of MiSeq data. These plots underscore Ion's need to correctly calibrate their quality scores; I showed that on 314 datasets they were badly sandbagging themselves. On the other hand, I'm surprised Illumina didn't generate any analysis to really hammer on the homopolymer problem with Ion Torrent, which has improved (based on some data I saw this week but don't have a slide) but is still serious (note Dan Koboldt's analysis of the 316 dataset with BLAT). Another set of plots really are just delivering a visual for a single numeric claim, so I won't reproduce them. That is simply that a single MiSeq run delivered >300X coverage of E.coli, whereas a single Ion 314 run delivered single-digit coverage. The MiSeq data analysis apparently (or effectively) predates the 316 data release, which delivered >30X coverage. If Ion wants to compete, they need to deliver the read length, chip loading and finally higher density chips that are promised, and the sooner the better. The advertising tagline for the slide is inspired: "Sequence More Strains Per Run, NOT More Runs Per Strain". Given that, it is surprising they didn't really demonstrate it. The ease of barcoded Nextera library preparation is an angle I would have expected Illumina to highlight, but the library described was built by conventional means. Demonstrating 10 barcoded genomes with similar coverage would proved the tagline, and underscored a gap that Ion will have a hard time bridging. The final page of the presentation does bring out a number of other key messages: the simple integration of MiSeq into the existing GAII/HiSeq universe of protocols and application kits, the software base tuned for Illumina, homopolymer accuracy and paired end modes. Given all that, the biggest edge Ion has really is the promise of beating Illumina in the future, without having to upgrade the box. This week at a meeting, two of the premier genomics outfits agreed that they are expecting only modest further improvements in HiSeq output, suggesting that the basic chemistry and detector system cannot support much more. HiSeq, of course, is currently running read lengths of only 100 and has the opportunity to go to the 150 that GAIIx and MiSeq are doing. Of course, both groups would be quite happy to be surprised by Illumina, they just aren't expecting another 10X improvement. Ion, of course, is promising multiple rounds of further 10X improvement. If they can really deliver this, and the kits/protocols and the longer read lengths (which Jonathon Rothberg suggested recently obviates the need for paired ends, though one comment on my last piece claimed Ion is promising paired ends), then they will be able to compete. In that vein, I expect that the release of the 316 chip will soon be followed by an announcement of a 320 chip, and/or an announcement of an accelerated release schedule for the 318 chip (ideally as a month, and not the more ambiguous quarter). Good stuff! I suspect Illumina's choice of X-axis was the result of using FASTQC to generate the plots. I also thought the lack of a Nextera prepped library was an oversight on Illumina's part. I have just recieved 12 long-range PCR products Nextera prepped and multiplexed on MiSeq. Once I get into analysis I'll post something about the run. So far so good. Has HiSeq topped out is an interesting question and one I am sure many of us are thinking about. Anyone interested in a guessing game about what's next. Another imaging module and MiSeqesque fluidics would speed it up maybe two fold. A bigger flowcell could then be used keeping run times the same but giving 2TB allowing HiSeq 2000 to live up to it's name. Great stuff! So easy to keep up with this new NGS stuff. Just read Omics! ?I have just recieved 12 long-range PCR products Nextera prepped and multiplexed on MiSeq. Once I get into analysis I'll post something about the run. So far so good." I am being sarcastic of course but when you read the article, you can definitely see a disconnect between legal, R&D and marketing at Life. A major disconnect. Those types of agreements should have been finalized way before LT even came into talks with Ion. Shouldn't this be directed more to DNA electronics? Actually not really, DNA electronics simply make the chip, they are purely a manufacturer and make chips for other companies. It is truly LT legal that has all the IP together as one and it is truly hydrogen generation and detection which sets things apart in the field. If you read the article, you''l find the problem isn't with LT, but rather with how Pourmand perceives Stanford handled the licensing.